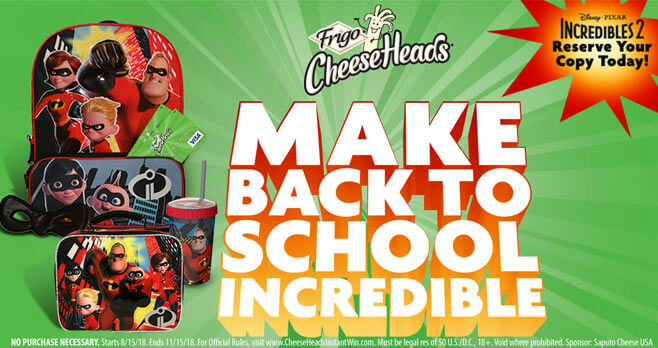 Visit cheeseheadsinstantwin.com and play the Frigo Cheese Heads Make Back to School Incredible Instant Win Game for your chance to win incredible prizes including Disney-Pixar’s Incredibles 2 backpacks, lunch boxes and tumblers. Eligibility: The Frigo Cheese Heads Make Back to School Incredible Instant Win Game is open to all legal US residents physically residing in the 50 United States and District of Columbia who are 18 years of age or older, as of the date of entry, and have reached the age of majority in the state of residence. Promotion Period: The Sweepstakes starts at 12:00:01 PM ET on August 15, 2018, and ends at 11:59:59 PM ET on November 15, 2018. Limit: One (1) Game Play per person per e-mail per day during the Entry Period. Prize(s): The grand prize consists of an Incredibles 2 Backpack and a $50 Visa Gift Card.